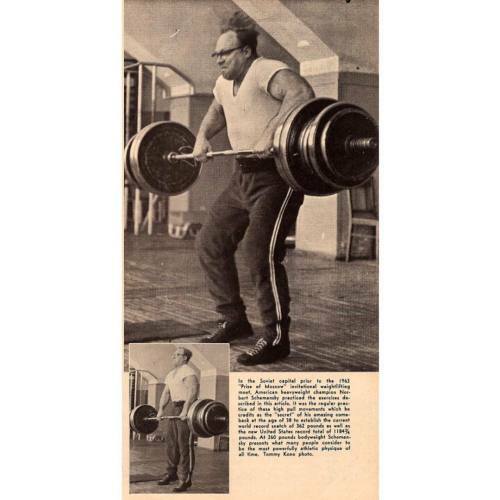 American heavyweight weightlifter Norbert Schemansky back in 1963 performing what the Chinese have re-popularized as the Panda Pull. Credit goes to Jim Scmitz (@jimschmitz) of The Sports Palace for keeping me educated on my weightlifting history and also for being such an invaluable resource and phenomenal coach. 1. 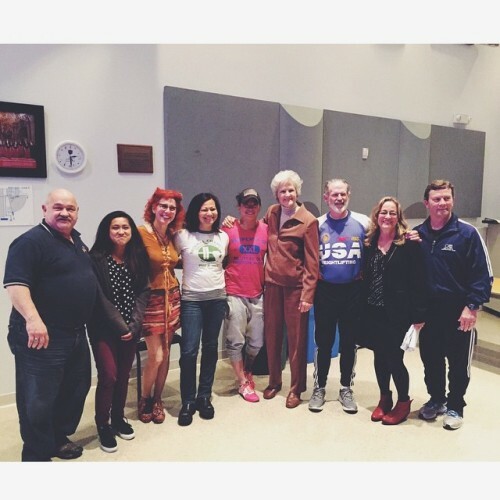 Rachel Silverman and Giselle Shepatin - Hall of Famers and pioneers in women’s weightlifting. 2. Joann Aita (@joannaita7) - Masters World Champion in weightlifting and powerlifting. 3. Marilyn King - 1972 + 1976 Olympian in the Pentathlon. 4. Chloe Tacata - 15 year old youth national champion and record holder. The Sports Palace est. 1968. My first home coached by Jim Schmitz (@jimschmitz). Coach Jim Scmitz (@jimschmitz) catching a quick workout at The Sports Palace. 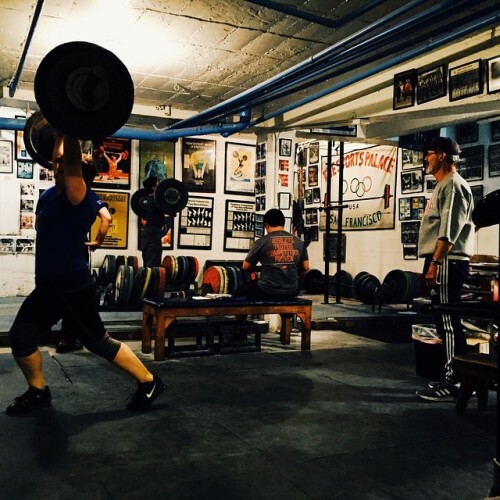 Coach Schmitz has been lifting since the 60s and has long believed Olympic-style weightlifting is the best total body workout a person can receive demanding a high level of coordination, power, speed and strength. Still practicing what he preaches at the age of 68, Jim shows us that weightlifting can be beneficial (and fun!) for everyone that chooses to participate. Heading down to The Sports Palace is like walking into a time capsule. Jim (@jimschmitz) keeps the walls decorated with weightlifting history. I don’t know why I still get surprised, but every now and then Jim will bust out with some cool artifact that’s he’s kept in storage like this cool barbell set. Of the many things I love about weightlifting, one is the inclusiveness of all the different body types and two is the development of an athlete’s specific technique. I head down to hang out with my coach Jim Schmitz (@jimschmitz) once a week at The Sports Palace. The place is rich with history and Jim’s always got a good story or two to tell. He also records all of the local, national, World and Olympic level meets he attends. This benefits his lifters and gives everyone something to observe when they sit between sets during practice. Getting some squats in at The Sports Palace before heading out to spend the next few days with family. Run by Coach Jim Schmitz (@jimschmitz), this is the place where I first grew my roots. The walls have history dating back to the 70s and Jim can recount stories of every Olympic, World, National, and PWA local level meets. 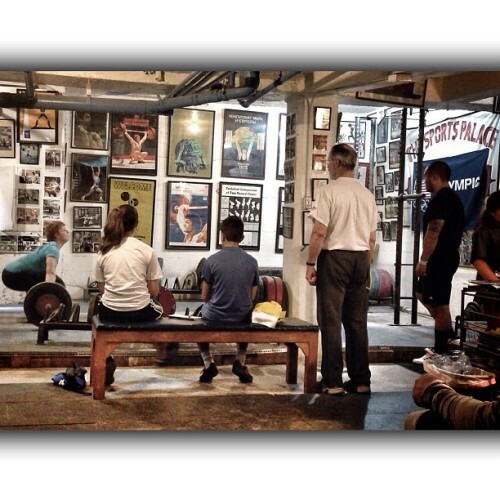 I’ve been to many wonderful weightlifting gyms and this is by far still my favorite. We’ve all heard the benefits of training with a partner, with a club, watching YouTube videos of high level lifters do their thing. Part of it is the psychological push of training with someone(s) better than you and sharing the common goal of trying to level up the playing field. But the other part is what we all wished we could do back when we were still in school: learn through osmosis while we slept drooling over our text books. Hanging out with @jimschmitz at The Sports Palace down in So San Francisco, CA. This place has more history than a museum! I’m pretty sure the Eleiko bar I’m training on is just as or older than I am. Love this place! Can’t imagine a better way to spend my holiday weekend but down in the dungeon.